Hurricane Earl made its way to Ambergris Caye, along with other districts of Belize on Wednesday, August 3rd. A category one hurricane, Earl left a dreadful path of destruction, destroying many low-lying homes, docks, and businesses. In the aftermath, there was much rubble along the beach in San Pedro Town. The Phoenix Resort staff, alongside volunteers, host trash clean ups every Saturday morning. This past Saturday, August 6th, volunteers, including local celebrity, Vic Murphy, lent a hand to clear the remains of the storm. 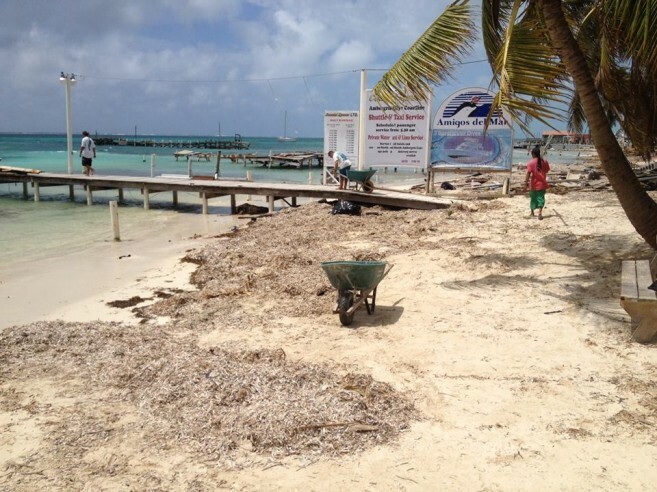 Areas that were cleaned included the beachfront, Ecologic Divers, and by Mayan Princess Hotel. With team effort, the areas were cleared of all debris and trash. The Phoenix encourages anyone to come out and volunteer to keep the island trash-free on Saturdays at 8AM. All bags, gloves, and water will be provided. Kudos to everyone who volunteers and joins the cause!